John Ford Jewelers if evolving to better serve the needs of his customers and will soon start to focus solely on his Lightening Ridge Collection of Black Opals and Diamond gemstone designs. Our evolution is your only opportunity to own John’s exquisite, one of a kind jewelry at up to 50% off normal retail prices. Our evolution is your last opportunity to own John’s exquisite, one of a kind jewelry at up to 50% off normal retail prices. The John Ford Evolution Sales runs December 1st, 2016 – December 24th, 2016. Shop late ‘til 8 every Wednesday night! Lightning Ridge Australia is the most famous source for Opal in the World. What better name for a collection of exclusive black opal set with stunning diamonds. Lightning Ridge Black Opal is the standard by which all opals are judged. I am particularly found of Black Opal and consider it to be the finest gemstone available on the market today. We are direct Black Opal importers from Australia. We work with one of the largest and most ethical exporters of Black Opal in the World. The Opal we sell is strictly from Lightning Ridge and the wide variety of color is amazing. The Minas Gerais is a region of Brazil that produces the majority of gemstones found in Brazil. We are direct importers of Emerald, Aquamarine, Morganite, Topaz, Citrine and Peridot from gemstone cutters in Brazil. We also use this collection to categorize other gemstones that we import from South America in general. 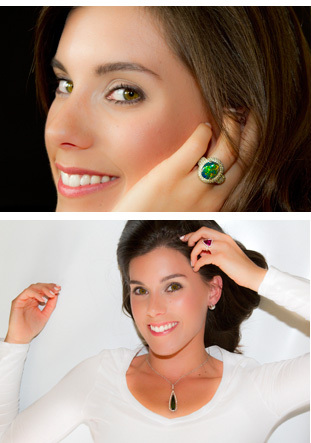 Emeralds, for example are imported directly from Columbia or Brazil and origins are always available. Enjoy these spectacular gems set in unique designs and accented with breath taking diamonds will make your next occasion one to remember. Passion and romance is something that we all desire. We celebrate this desire in the vibrant colors of ruby and sapphire, the pastels of kunzite and the rich blues of tanzanite. We are proud to offer you our collection of gems that are accented with stunning diamonds and unique designs that will stand out in any room, in any occasion. These gems are directly imported from the Far East and Africa and designed and manufactured in Galveston, Texas. This Collection celebrates love and marriage! The stars of this collection are diamonds. We import the diamonds we sell from Israel and India. We specialize in certified large diamonds. We manufacture unique diamond engagement rings that you will be proud to wear. We are proud of our entire line of unique diamond jewelry from stud earrings to unusual pendants, bracelets to rings that will help you celebrate the special moments in your life. Remember, if you don’t see it we can manufacture it. The South Sea Collection refers to our offering of Custom Cultured Pearl Jewelry. The primary focus of the collection is South Sea Pearls that we directly import from Australia, Malaysia, and Tahiti. The colors range from pure white through champagne to the dynamic hues of the Black Tahitian Pearl. Exotic strands and earrings are the cornerstone of this collection. We hope you enjoy our newest designs with round diamonds, white and fancy colored being set directly into our South Sea Pearls. Over the years, John Ford has created some truly amazing pieces. This is a collection of some of the jewelry that has been sold, including diamond rings, diamond earrings, diamond and opal pendants, sapphire rings, and other pieces.